If you've got lots of magazines in your home, and want to get rid of them, but don't just want to chuck or recycle them, here are the top seven places to donate magazines you should consider. If you've got a lot of old magazines, chances are you really enjoy reading them, but I hope I've convinced you, as part of the Organizing Magazines, Newspapers & Catalogs Challenge to part with most of your older copies instead of hanging on to them indefinitely. There are a lot of other people like you, who also love to read the articles, see cool pictures and get some great new ideas from the magazines. Knowing that you'll be giving them to someone who appreciates them will make you feel better about getting them out of your home. In addition, letting someone else read the magazines is eco-friendly to boot! It is actually even better than recycling, since it is letting someone else "reuse" the item which you were just going to throw away. 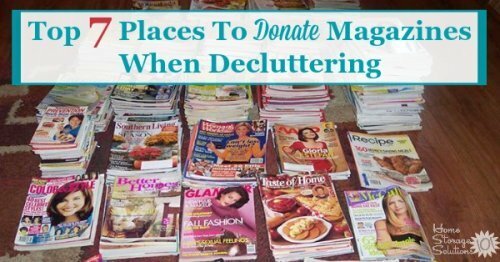 Here are the top seven places to consider, in no particular order, when you decide to donate magazines to charity or another organization or business. One of my favorite places to donate both books and magazines is to my local library. Even if the library does not need the magazines itself, for its patrons, many libraries hold a Friend of the Library Sale where they can sell your used magazines to help with their own fundraising. Many elderly people are looking for items to entertain themselves, especially if it is difficult for them to move around. Therefore, they are often appreciative of new reading material, and also a friendly chat when you come to drop the magazines off. Our country's solidiers, especially those serving overseas, are often looking for fresh reading material too, and would appreciate your donated magazines. Similary, veterans associations may be looking for reading material as well. Sitting back and reading a magazine can help you relax and take your mind off things, which is one of the reasons we all enjoy getting them. The same can be true of women and families in shelters who may appreciate something to take their mind off other matters for a while with an interesting article or two. Any place that has a waiting room, where people are looking to pass the time, is an ideal place to donate magazines. If you really want to have the recipients appreciate them, choose waiting rooms for businesses and organizations whose clients would enjoy the type of magazines you are donating. For example, if you've got car magazines donate them to the oil change business, or Guideposts (I love that magazine!) to your dentist office waiting room. The Hospital I used to volunteer at has a special drop box for magazines. I love them and get over 10 subscriptions a month. (I have a freecycle account and they're free). I don't want to waste them because they're perfectly good. I put them in the box there and the volunteers drop them off in all of the different waiting rooms. I just cut the white label where my information is off before they go. When they're not in reading shape in the waiting rooms, they recyle them. It works great because the patients get better magazines, you can read them new and guilt free and they get recycled in the end! My kids, when they were in preschool, used pictures from magazines all the time during arts and crafts. They would cut pictures out and glue them on just about any type of project the teachers could think of. Schools, preschools and daycare centers are always on the look out for (family friendly) magazines they can use with their kids, to let them have some fun, and they'll really appreciate the resource. This is actually my favorite suggestion, and actually can be used in combination with any of the other ones above, since the last person in the swap can then donate them to the places listed. I had a little magazine swap going with several of my friends for a couple of years, before we all started discontinuing our subscriptions because we got too busy with kids, and it was a lot of fun. I got to read several magazines I didn't even subscribe to, and it was a great excuse for everyone to get together monthly and have a girls night, along with actually trading magazines. Before you give away any of your old magazines (such as during your declutter magazines mission here on the site), make sure you remove or mark through the address labels that are on them, so others don't see your name and address. Further, consider the theme of the magazine before you donate them. You don't want to give somethig inappropriate to small children for example. In addition, try to give hobby type magazines to a group who would enjoy them so they are well appreciated. Finally, before you donate to any of these locations a quick phone call or discussion with the receiptionist may be helpful. Make sure they are actually accepting the magazines and will have a use for them, so you are actually helping, not making an inconvenience. If you've got more tips for how to donate magazines, or additional suggestions for places we can all share them in our communities, please tell me below in the comments.